What do you do for the teacher who has the patience to put up with 30 kids 5 days a week 10 months out of the year? 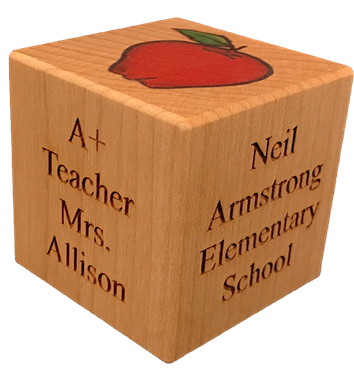 You thank them with a personalized teacher block! Ok and maybe a Starbucks gift card or Godiva chocolate (yup my go to gift cards). 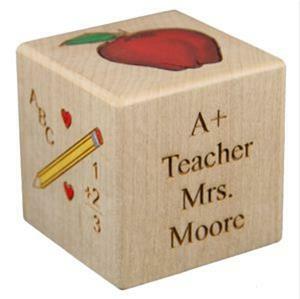 The teacher block is something they can keep on the corner of their desk to remind them they made a great impression on a little growing mind. It is also available in color! Laser engraved with the details of that school year. You can include the name of your child so they will remember the bright and shining star in their class. Graphics are an apple on the top and pencil on the side. If ordering colored these are the items that will be colored. The colored version is now made with our UV printer and the block is varnished with a PolyWhey finish. The all engraved version is still with our bees wax finish.